To mash is what we do when we beat or press something until it becomes soft and pulpy, like we do when cooking, and it also means ‘to crush.’ As a noun, a mash is a soft and pulpy mass and also a mix of grains used to feed horses or cattle. 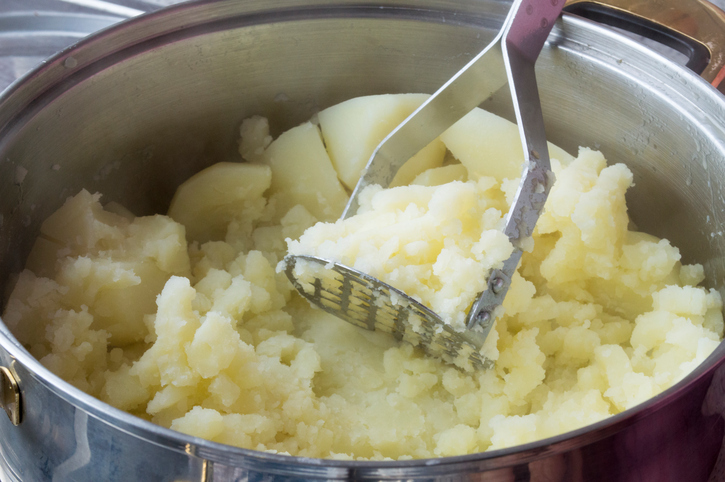 Informally, in UK English, mashed potatoes are often just called mash. The carpenter mashed her thumb with the hammer. The apples are beaten into a mash before they are used to make cider. The farmer feeds his cattle mashed corn. Ben went to the pub and had a pint of beer and some pie and mash. M*A*S*H is also a classic American TV show from the 1970s. It’s about medical officers in the Korean war. In this case, MASH stands for Mobile Army Surgical Hospital. This is the famous opening theme song. In US English, mash had a completely unrelated slang meaning, though it is rarely used now. As a verb, it means ‘to flirt’ and, as a noun, a mash is both the flirting or the person you flirt with. A mash is also a mixture of ground malt and hot water used in brewing and distilling. In US slang, it is also a type of whiskey made from a mash of fermented grains. Mash dates back to before the year 1000. The Old English noun mǣsc, and later the Middle English masc, were usually found in compounds like masc-wyrt (mash-wort, or infused malt), and can be traced back to the Proto-Germanic root maisk-, and further back to the Proto-Indo-European root meik-, ‘to mix.’ They are related to the Swedish mäsk ‘grains for pigs,’ the German Maisch ‘crushed grapes’ or ‘infused malt,’ and the Old English meox ‘dung or filth.’ Mash‘s original meaning was confined to brewing, but it took on the more general sense of ‘anything pressed into a soft or pulpy consistency’ by the late 16th century. The figurative sense of ‘confused mixture or muddle’ is also from the late 16th century. The verb does not actually come from the noun. It dates back to before the year 1000 as well, as the Old English mæscan, and later the Middle English Masc(k)en, which come from the same origin as the noun.